The Links, Incorporated is an international, not-for-profit corporation, established in1946. The membership consists of more than 15,000 professional women of color in 285 chapters located in 41 states, the District of Columbia and the Commonwealth of the Bahamas. It is one of the nation’s oldest and largest volunteer service organizations of extraordinary women who are committed to enriching, sustaining ​and ensuring the culture and economic survival of African Americans and other persons of African ancestry. San Diego Links Celebrate over 60 years of Service to the Community. The Links Incorporated is composed of professional women of color who focus on and emphasize education, cultural appreciation, and social responsibility. 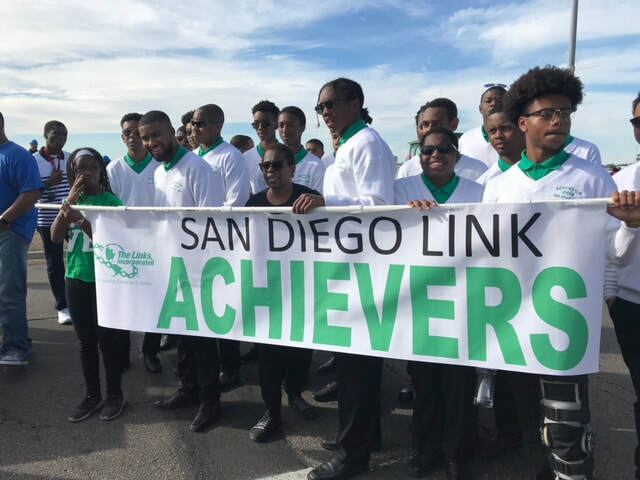 ​The San Diego Chapter of The Links, Incorporated is 61 years old and has continuously demonstrated its commitment to empowering and uplifting the lives of the citizens of San Diego and beyond through an array of transformational programs geared toward enriching and educating our underserved communities. ​One of our most successful signature projects is our Link Achiever Program for African American high school senior men, on their journey into college and future careers. Since its inception over 31 years ago, the Achiever Program has been recognized locally, regionally and nationally for its excellence in programing and sustainability. ​Another project is our award-winning Links 2 STEM Program for elementary and middle school students. Who are challenged to master computer science programing, robotics and artificial intelligence platforms. In addition to that the Link’s have five facets of programs through which each chapter help’s impact lives here and abroad. They are, National Trends, Services to Youth, International Trends, The Arts and Health and Human Services. It is through these programs that we are effectively able to bring about recognition, change and empowerment to some of our country’s biggest challenges. ​As you browse through this website we hope you are excited about our rich history and our many contributions to our local and global communities, and that you would consider donating to our organization, so that we can continue to sustain these programs and help keep our youth on a positive path to college and a successful future. ​To promote and engage in educational, civic and intercultural activities. To enrich the lives of its members and the larger communities by working to develop interest in common goals of achievement.